This week we provided a collection of recipes that utilized some of our greens that may not be commonly used for everyday cooking for some people. Check them out below and send us pictures of your creations! Stir the ketchup with teriyaki sauce, lime juice, sesame oil and brown sugar until well blended. Reserve. Place the salad greens in a large bowl. Separate the salmon into large chunks. Add salmon to the bowl along with the carrot, cucumber, coriander leaves and radish. Toss gently with enough dressing to coat the ingredients. Add more dressing to taste. Sprinkle with sesame seeds just before serving. In a small bowl, combine soy sauce, vinegar, brown sugar, and 3 tablespoons water. Slice chicken into thin strips. In a medium bowl, toss chicken with cornstarch until coated. In a large wok or skillet, heat oil, garlic, and ginger over medium-high until fragrant, about 1 minute. Add chicken in a single layer, pressing against pan to sear. Cook, stirring, until lightly browned and just cooked through, 6 to 8 minutes. Add bok choy and chile and cook, stirring, until bok choy slightly wilts, about 1 minute. Add soy sauce mixture and cook until sauce thickens slightly, 2 minutes. Serve over rice. Bring a large pot of water to a boil. Cook the pasta al dente according to package directions. Meanwhile, heat the olive oil and butter in a large skillet over medium-heat, until the butter is melted and the oil just begins to shimmer. Add the garlic and onion and cook, stirring occasionally, until just softened, about 2-3 minutes. 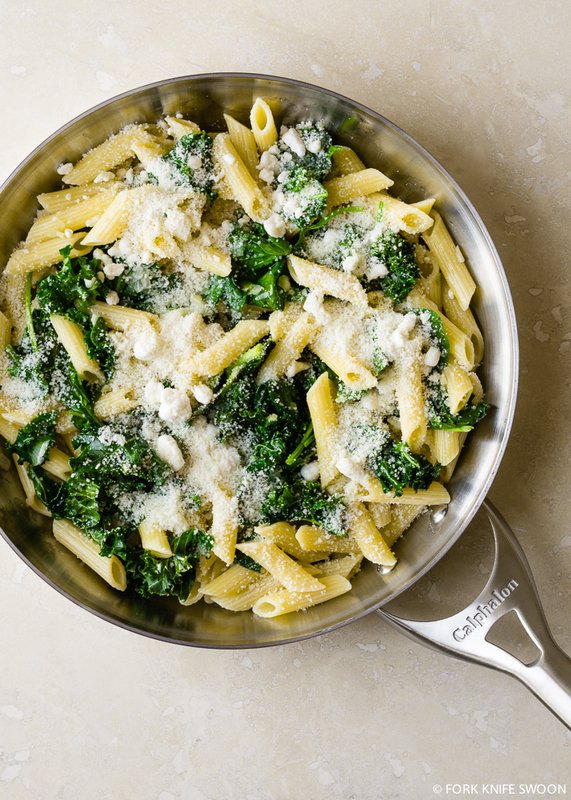 When the pasta has about two minutes to go, add the kale to the skillet, followed by the spinach, and stir constantly until the greens just begin to wilt. The greens will continue to cook from the heat of the pasta, so be careful not to overcook. Drain the pasta, then return the pasta to the pot (off of the heat). Pour the greens mixture over the pasta, add the goat cheese and Parmesan, and stir to combine. Serve warm. Combine all ingredients into your blender. Blend on full strength until thoroughly incorporated and smooth.